Having never been to an Indian restaurant and having a group of (awesome) Sri Lankan friends, it isn’t hard to guess where I’d go to if I ever needed a restaurant suggestion. Or better still, someone to take me to one =] Since I’d taken my friend to an Asian restaurant (sushi train) last year, she decided to take me to try out Indian food, which is why our small group end up in front of Ambi’s Indian Restaurant on a Monday night. Even if it’s three quarters of a year after I took her out ;P We had pondered about whether or not to make a booking, but decided against it since there was another Indian eatery down the road if it was full. We needn’t have worried though- we were the only ones there when we walked in! The mango lassi is sweet and surprisingly thick. Given that I love mangoes, and it’s been too long since I’ve had one (or even anything mango flavoured), I loved it. Both the sweet and the cold also went well to cool the spiciness of the curries too! The rice is ordered separately to the curries, something which I’m unused to, and we decide to order a saffron rice just to try it out. The saffron rice was…well, laughable. Despite never having saffron rice before, I do know that saffron is yellow, and I was pretty sure that saffron rice is meant completely yellow, and not just a splodge of yellow rice in a dish of plain rice. Nevertheless, it was fun to try, even if it mightn’t have been worth the extra dollar it costed. Funnily enough, I also found bits and pieces of yellow rice in the plain rice, along with other funny spices which were in there in a way that made me uncertain whether it’s there deliberately or not…..
We order butter chicken, simply because it’s a dish we’re all familiar with- even me. Despite never having had butter chicken at a proper Indian restaurant I’ve tried authentic butter chicken a few times thanks to my friends, or rather their mothers at parties and get togethers. The butter chicken does not dissappoint, and the rich and flavourful sauce has us finishing this in no time. I find the chicken surprisingly tender, perhaps because they use chicken thigh instead of breast (I think) which makes me love it even more! The menu states that we can choose how hot we would like the curries we order, so we ask for both curries to be mild because I can’t stand hot very much. The Chicken Tikka Masala however, can only be medium-mild because the sauce base itself is mild from the spices used. Despite it being a slightly common Indian curry, I’d never heard of it before and my friend explains that it’s similar to tandoori chicken- without the bones. Which sounds all good to me, only I’m a bit scared of the spiciness (I really don’t take hot food well). The curry is quite different to the butter chicken- it’s not as creamy, and has a strong tomato flavour. It is extremely flavourful, and although I have no idea what the spices used in it were, I can tell they used a lot in it 😛 As for the spiciness, I’m surprised that it isn’t too spicy and eventhough my mouth slowly got hotter and hotter through the meal, it was bearable enough not to stop me from continuing to eat it! I personally preferred the butter chicken better, perhaps because of the spiciness, but I loved this too. Our order for raita seemed to have dissappeared and it isn’t before we’ve gotten through half our meal that we decided to enquire about it. Now I usually don’t like mint, but I found this minty yoghurt sauce a nice accompaniment to the spicy curries. An electric oven was never high on my list of things I wanted- why would I want an oven, when I had a perfectly functioning gas one at home? Sure, my oven often refuses to start (and usually in the most convinient times! ), but it’s always managed to create beautifully baked goods. We ended up ‘testing’ our new oven by baking garlic bread the next morning, forgetting to read the manual (because we were all so excited) and skipped the ‘do this before using you oven’ step until the oven started smelling like stinky plastic……Woops! But since you can’t really test an oven by baking garlic bread, I tested it again. For lunch! 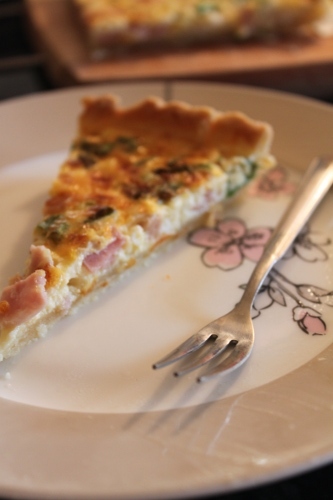 I chose a simple quiche recipe to also try out my new tart pan- I’ve been wanting one for a while now (they make pretty tarts!) 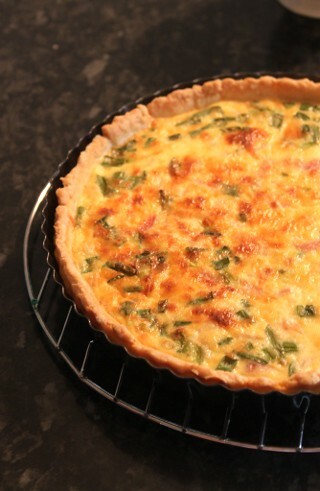 The tart pan wasn’t very deep so I had to halve the recipe I usually use. It also had a removable base so when I was transferring the pastry (in the tin) with one hand under the tin, it fell out and fell on the floor- I guess my hand span is less than 18cm then! The tart itself didn’t turn out too bad and the tart pan made it look so much prettier than when I bake it in my glass dish. But it was really thin, and definitely not filling enough for three of us (I could easily eat the whole thing). But the oven was so different to my gas oven! I think the lack of flame makes it look not as hot as the gas oven, but I have a strange feeling that the actual temperature in the oven is lower than the temperature on the dial because the tart took longer than I expected it to take. Not being able to turn on a light to look inside was also uncomfortable (and I couldn’t even open the door =[ )and I found it really weird when I opened the door and didn’t receive a huge blast of hot air blowing at my face. I still like my gas oven better, but having a smaller electric one means that I don’t have to feel guilty about using the oven for 5 minutes. Which means I can now bake even more!! 3.Pour egg mixture into a hot, baked pastry shell. Bake in the 180 oven for ~30 minutes or until knife inserted near centre comes out clean. Let stand 10 min before serving. I’ll be lucky if I even get 2 days of studying done. It’s funny how it only seems like a couple of weeks ago that we started off this term. 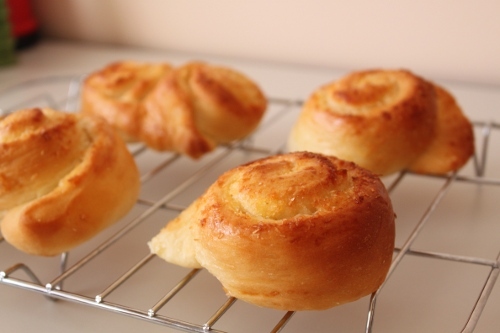 I still remember sitting in front of the computer, and writing out my Cocktail Buns post after school a couple of months ago, excited about all the recipes I’d try during the holidays and all the activities I’d planned to do. And now, I’m sitting here doing almost the same thing . But then again, time plays funny tricks on me all the time- in the kitchen, twenty minutes passes in a flash when I’m whipping up a cake batter, but seems to take forever whilst waiting for a cake to cool. Which is why I love baking things which can be eaten (almost) straight from the oven- even if they burn my tongue =] I guess that’s one of the reasons I love baking bread. There’s still so much for me to learn when it comes to bread baking, (and baking in general) so it was about time I tried something new with bread. Not simply a new recipe, but a new technique, known as the water roux method. Instead of throwing all the ingredients together, this requires the flour to be cooked in water to form a paste to be added to the dough. Whilst this doesn’t sound too exciting, it seemed more fun than the normal method, and I’d read that it produces a very soft and fluffy bun too! I love the versatility of Asian bread dough- it’s amazing how one simple bread dough can be made into a billion different types of buns, each so different from one another. Infact, so different that I once thought that each type of bun used a different dough altogether! I was shocked when I first bought a book on Asian breads, to find that out of the hundred or so recipes in there, that they all used the same bread dough recipe! 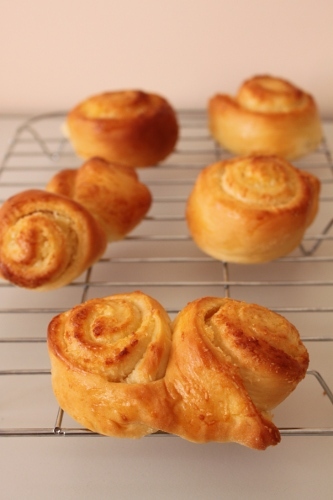 For my first attempt at this dough, I thought I’d keep it simple and make my favourite- coconut roll buns. When we first saw these buns at an Asian bakery, my mum told me of how she used to love to eat them when she was young. The coconut buns sold in bakeries in Hong Kong were much larger (and cheaper) than these ones in Sydney and unravelling such a large bun was not only fun but extremely satisfying. Unfortunately, coconut buns of such size are nowhere to be found in Sydney but a smaller, ‘standard’ sized version can be found in most Hong Kong style bakeries, as all the breads are usually the same size. The filling is much like that of a cocktail bun, only less buttery but tastes just as good. I’ve also found that they taste best after a little heating up in the toaster- drying up the coconut a little bit and giving the bun a little crunchiness on the crust! 7. Brush the top with egg wash and bake at 180oC for 10 minutes or until golden brown. Brush the hot buns with jam or butter immediately after baking.